The House Finance and Appropriations Committee has split off into subcommittees to discuss the 3,000+ page operating budget. 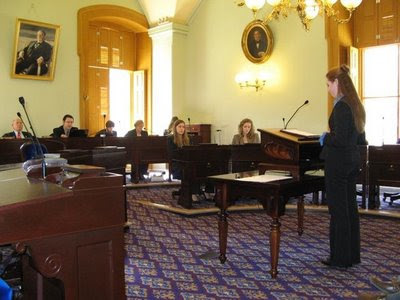 AICUO staff has been whiling away the hours on narrow wooden chairs listening to other interested parties in the higher education subcommittee, chaired by Rep. Ted Celeste (D - Grandview Heights). Wednesday, we presented our side of the story and advocate for fair representation of our campuses in the budget bill (HB 1). University of Dayton senior Molly Dineen, Hiram College President Thomas Chema, and Capital University President, Denvy Bowman all gave testimony before the five-member subcommittee that includes Rep. Ted Celeste (chairman), Ranking Minority Member - Rep. Randy Gardner (R - Bowling Green), Rep. Kathleen Chandler (D - Kent), Rep. Lorraine Fende (D - Willowick) and Rep. Clyde Evans (R - Rio Grande). Their testimonies were succinct and personalized. All gave their views of how the budget, as drafted, would affect their respective institution's students and the independent college sector as a whole. 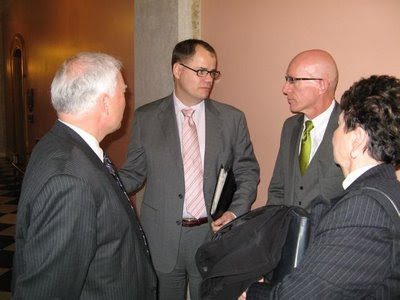 They advocated for more funds within the proposed block grant formula (to ensure that the program will provide the flexibility that the chancellor expects), as well as fair and equal inclusion in three educational programs within the budget: Choose Ohio First, Teach Ohio, and the Co-op & Internship program. Each witness was accepted graciously by the committee members and all received accolades post-hearing on their unified and articulated message. For a copy of each witness's testimony, please check out the Legislators Section on our website.